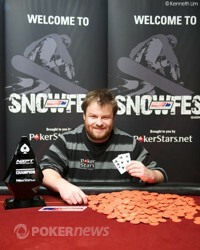 After an exciting day of poker action, the 2012 PokerStars.net Australia New Zealand Poker Tour Queenstown Snowfest Main Event champion has been crowned! The player who walks away with the title, all the glory and the NZD$110,600 first-place prize is Australia's David Allan. The final day started with nine players all hoping to make it where Allan stands right now. However, there can only be one winner and so eight players had to fall short. 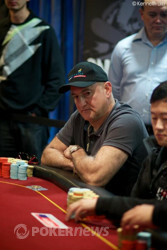 The first elimination occurred within the first ten minutes, with the short-stacked David Evans being sent home in ninth place. Evans got his stack in good holding against Ken Demlakian’s on a flop, but was unfortunate to run into an ace on the river. The next player to find the rail was Evans’ fellow short stack, Ivan Zalac. It was Ricky Kroesen who eliminated Zalac, with Kroesen’s trumping Zalac’s . Zalac was eliminated in a gallant eighth place after winning a side event earlier in the week. It didn’t take long from there to eliminate Team PokerStars Pro Bryan Huang in seventh place. The play was starting to slow down again here, but eventually it would be Matt Wakeman who was sent home in sixth place. During five-handed play, Westmorland would lose a huge amount of his chips to multiple players and Demlakian would re-claim his chip lead. The fourth level of the day was when the action came to a halt and it wasn’t until the fifth level that the next elimination would occur. It was almost two and a half hours since the last bust-out, but inevitably it had to happen and unfortunately for David Zhao, he would go home in fifth place. It didn’t take long from there to find our fourth-place finisher and that would be Ricky Kroesen. The three-handed battle would last for more than an hour, but it would eventually be Jordan Westmorland who would go home in third place. Westmorland’s tournament came to an end at the hands of Demlakian. Having eliminated Westmorland, it was Demlakian who started heads-up with a slight chip lead over the ever-aggressive Allan, but it wouldn’t last for long. Allan edged in front very quickly and it stayed that for way for short while, before the lead then chopped and changed several times. It eventually got to the point where it seemed Demlakian had a big enough lead to run away with it. However, Allan wouldn’t go down without a fight, managing to manoeuvre his 20 big-blind stack all the way to reclaim a chip lead. From there, Allan never looked back and after a two-hour heads-up battle, Allan eliminated Demlakian in second place. For his gallant effort, Demlakian was sent home with NZD$70,400 – his first and biggest live tournament score to date. A big congratulations must go out to Allan as he goes home the NZD$110,600 first-place prize. This marks Allan’s first major live tournament victory, with the revered Australian online player joining an elite group of ANZPT champions. 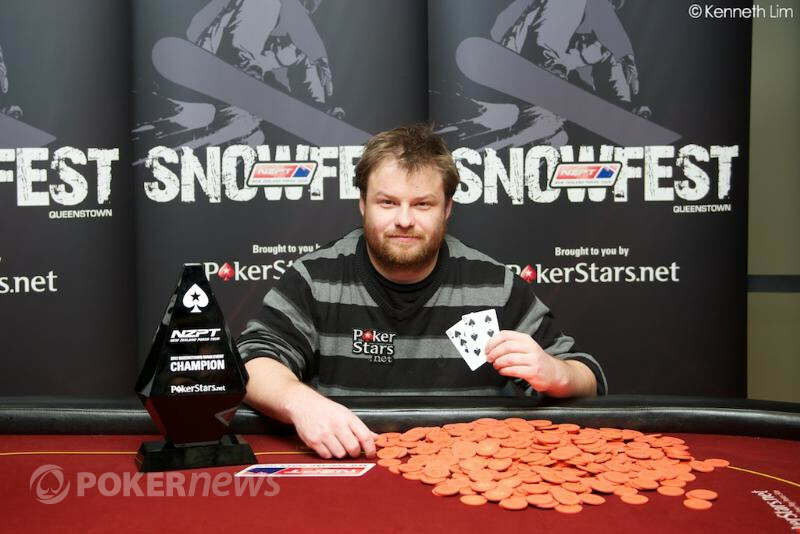 With the completion of the event, that wraps up PokerNews' coverage of the 2012 ANZPT Queenstown Snowfest. Our many thanks to PokerStars and to all the staff at the SKYCITY Queenstown Casino for another fantastic event. Just because we're done here, doesn't mean the live reporting stops. PokerNews' worldwide leading Live Reporting Team is constantly all over the globe providing updates from the biggest and best tournaments on the circuit, so be sure to check those events out as well. We'll see you at the next stop. Ken Demlakian Eliminated in 2nd Place (NZD$70,400), David Allan Wins! After a tough two-hour heads-up battle, the final hand of the 2012 PokerStars.net Australia New Zealand Poker Tour has played out. It started with David Allan limping the button and Ken Demlakian checking the big blind. Both players opted to check the flop and it was on to the turn. Demlakian led for 50,000 here and Allan called. The river was flipped onto the felt and Demlakian led for 60,000. Allan then announced a raise to 170,000 and Demlakian shoved all in. Allan made the call and Demlakian's tournament was at risk. "Two-pair," Demlakian said as he turned over . "Flush," replied Allan, tabling as he did so. With the last hand dealt and all the chips in Allan's stack, Demlakian goes home in second place, collecting a very nice NZD$70,400 in prize money. Not long after the break and David Allan has taken a big chip lead over Ken Demlakian. It all started with Allan first winning a small pot holding and going to showdown on a board. The big hand that played out started with Allan limping the button and Demlakian checking. On the flop, Demlakian checked and then raised to 110,000 after Allan bet 40,000. Allan called and then both players checked the turn and an was dealt on the river. Demlakian led for 120,000 here and Allan quickly made the call. Demlakian turned over his , which went straight into the muck when Allan turned over for flopped top pair and rivered trips. The players are back in their seats and ready to keep playing. Let's see if we can crown us a new ANZPT champion over the next two levels! The two players have been sent on a 10-minute break. Right before the break and David Allan has lost plenty of his chips back to Demlakian. Firstly, Demlakian won a couple of small pots and then he took down the following hand. Allan limped the button and Demlakian checked. On the flop, Demlakian check-called a bet of 40,000 and a was dealt on the turn. This time both players checked, ushering in the on the river. Demlakian led for 80,000 here and Allan made a quick call. When Demlakian tabled , Allan sent his cards into the muck and Demlakian scooped up the pot.